Our menu for the Superbowl was going to be simple. 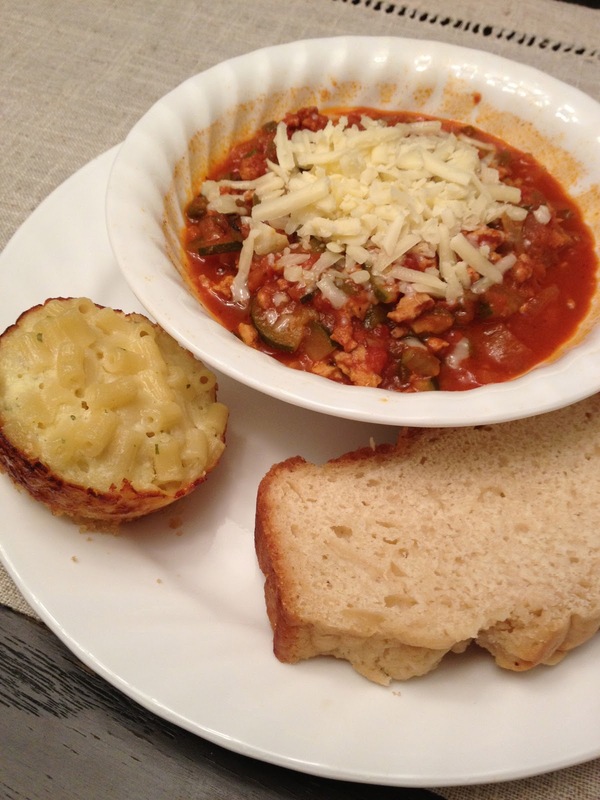 I had planned on sticking with my favorite chili recipe- Terrific turkey chili and my old standby- honey beer bread. Side note about this chili: adding beef broth to the turkey gives it that meaty flavor to fool the masses. I have faked out many people who still believe they are eating beef in this chili. Let's keep it a secret. We enjoyed our mac and cheese muffin appetizers, followed by the chili and beer bread. I watched a little of the game, and all of Beyonce's halftime performance (loved it! ), and then managed to pass out during the power outage and wake up in time for the end of the game. I'd say it was a successful viewing. Thank goodness for the power outage nap that powered me through the rest of the game! Maybe all games should come with a lengthy intermission? 1. Preheat the oven to 350˚ F.
2. Cook the pasta to al dente according to the package directions. Drain well. 3. While you wait for the water to boil, lightly grease standard size muffin pans with cooking spray. 4. Melt the 8 tbsp of butter in a medium sized bowl. Mix in the panko and ½ cup of the shredded cheese until combined. Firmly press your panko mixture into each muffin cup filling about 1/3 of the way (I used the bottom of a shot glass to pack it down in). 5. In a large bowl, combine remaining shredded cheese, boursin, and cold butter. Add your drained pasta. 6. In a liquid measuring cup, whisk the eggs, milk, and sour cream together. Add the liquid mixture to the bowl with the pasta. Stir in the salt. 7. Add your macaroni to the muffin cups and fill the rest of the way. 8. Bake until golden about 20-25 minutes. Remove from the oven and let cool in the muffin pans at least 10-15 minutes (otherwise they'll fall apart- I found out the hard way). Serve warm. Mac and Cheese muffins - genius. I'm making these for our next turkey frying event. I also want a baby football outfit now.